I have read a lot about the history of witchcraft in Europe – a pet subject of mine since I saw Vincent Price in the lead role of the 1960s hammy horror movie “Witchfinder General” when I was a kid – and I’m excited to learn that Cornell University Library in New York has put part of its esteemed and extensive Witchcraft Collection online. The collection features more than 3,000 rare books and manuscripts documenting the cruel persecution of the unfortunate women (and some men) accused of being witches over the centuries, and around 100 of these can now be viewed, free of charge, on your very own computer screen. Among the digitised items is a book written in 1691 by Richard Baxter, which includes a mighty strange case from the village of Beckington in Somerset. That’s where I live, that is. 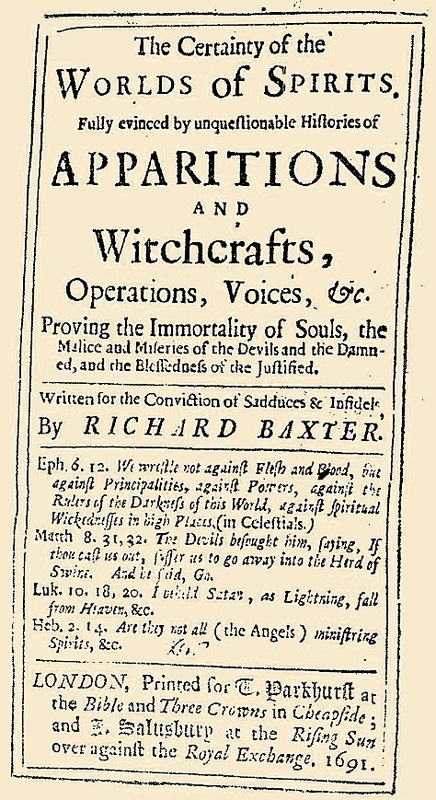 Richard Baxter’s book has the snappy title, The Certainty of the Worlds of Spirits, Fully evinced by the unquestionable Histories of Apparitions and Witchcrafts, Operations, Voices, &c, Proving the Immortality of Souls, the Malice and Miseries of the Devils and the Damned, and the Blessedness of the Justified. Phew. Click on the image to view the front page in its full 17th century, slightly odd English, Bible-quoting glory. The Beckington case centred on an 18-year-old serving girl named Mary Hill who, “having lived very much in the Neglect of her Duty to God”, was “seized by violent Fits [and] began to Vomit up about two hundred crooked Pins”. 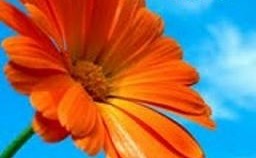 During the course of the next few months, Mary also threw up “nails, pieces of nails, pieces of brass, handles of spoons [and] pieces of glass”. Richard Baxter describes the nails as being “three or four inches long” and the pieces of brass as “an inch broad and two or three inches long, with crooked edges”. On several occasions, Mary’s bizarre fits were witnessed by the church minister of Beckington, who told Baxter that “to prevent the supposition of a cheat, I caused her to be brought to a window, and having lookt in her mouth, I searched it with my finger”, but he found nothing to suggest this was a trick. As word spread and more and more people came to Beckington to see the Amazing Metal Vomiting Serving Girl (they didn’t actually call her that, you understand, that’s just something I’ve made up), Mary Hill claimed that every time she had one of these episodes “she saw against the wall of the room wherein she lay, an old woman named Elizabeth Carrier”. Elizabeth was duly accused of witchcraft and dragged off to the county prison. When this didn’t stop her fits, Mary named two other women, Margery Coombs and Ann More, who were also arrested. Poor Margery died in prison soon after, but Elizabeth and Ann were sent for trial by jury at Taunton Assizes. Luckily for them, despite hearing sworn oaths from several witnesses and being shown many of the metal objects produced during Mary’s convulsions, the jury decided there wasn’t sufficient evidence to convict Elizabeth and Ann of witchcraft, and they were acquitted. Mary Hill’s vomiting fits continued after Elizabeth and Ann’s acquittal. But then one day, the village minister says “she swelled to an extraordinary bigness” and threw up “several pieces of bread and butter, besmeared with a poysonous matter”, which the minister judged to be “white mercury”, and her mysterious convulsions stopped a short time later. More than 300 years on, it’s difficult to know what on earth was going on with Mary Hill, the 17th century metal guru, but one thing is for sure. If she’d been around today, she’d have got herself on “Britain’s Got Talent” pretty damn sharpish. Piers Morgan would have loved her. I’ve eaten in places like that as well.